Connecticut players celebrate their Bridgeport Regional win last weekend – their 111th straight victory – and the last of their winning streak. Photo by Steve Slade. Connecticut did something Friday night that they haven’t in a while: they lost a game. And that’s good for women’s basketball in many ways. First, the death of the Huskies’ 111-game winning streak will take much of the ammunition out of what has been the modus operandi banter around this team, which affects the general basketball community. To wit: if any fan expresses fatigue at UConn’s dominance, they’re labeled a “hater.” This means “jealousy,” for all you old-schoolers, and it’s a common allegation in this era of hyper-sensitivity and inability to handle disagreement. But it’s far too convenient. It’s OK – and normal – to be sick of something that’s been repetitive, whether in life or sports. It doesn’t necessarily follow that the fatigued person hates that which made her or him fatigued; they’re just tired of it. If the cafe in your workplace served pizza for lunch every day, all year, you’d say hey, can we dine on something else? It doesn’t necessarily mean you are jealous of how good pizza is, or that you harbor any ill feelings toward pizza. Wishing for something new is just wishing for something new, period. My father tired of the New York Yankees way back when; many were happy to see the Los Angeles Lakers fall off recently. It happens. A second popular retort to anyone who dares not join the UConn love party is: “If you don’t like the Huskies, you don’t like basketball.” The implication is that UConn plays the game to such perfection that any basketball fan who doesn’t enjoy their game must not be a true hoops fan. But there are many styles of play, as there are many styles of everything. The Huskies are a fine shooting team, and are more of a finesse squad than anything else. In contrast, SEC teams play a more physical style of basketball that is more prone to showcase board-crashing than three-point shots. If you like to see banging in the paint, you’ll probably enjoy watching SEC and like teams take the floor more so than shoot-the-lights-out squads. That doesn’t mean you’re any more or less of a fan; you like what you like. By far the most volatile UConn discussion – especially after they claimed a fourth consecutive Championship last year – is whether or not their dominance is “good for women’s basketball.” Those who don’t think so say it is because blowouts are boring, that it removes any guesswork about season and NCAA Tournament play, and because who wins the trophy seems a foregone conclusion. Husky supporters say their dominance is good for the game because it showcases it at the high level where every team should play. 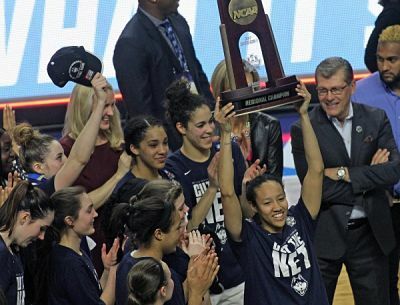 “Don’t get mad, make your team better,” was the popular response to the UConn-fatigued after last year’s Championship game. That’s like Donald Trump saying “get rich like me.” It’s not that easy. Geno Auriemma came to UConn in 1985, and didn’t win a national title until ten years later. Coaches today get five or six years tops to make anything happen, or they’re gone. Auriemma built a program over the decades that, by about year 17 (Taurasi-Bird-Cash era), was running itself. He and his staff don’t have to utilize too many resources to recruit players, as athletes come to them or say yes the first time they’re asked to sign. Husky coaches can spend most of their resources on precise, methodical player development, which is a luxury most teams don’t have. UConn doesn’t need to do much publicity, either, as every news outlet in Connecticut pumps out story after story on the team all year round. It’s no wonder Auriemma’s teams have such tight play, because creating that is his only job. Telling other teams to “just get better” is not a fair statement; it’s overly-simplistic and trite. UConn’s loss is good for women’s basketball because it’s shown athletes that anything is possible. I saw one Division I player tweet just that sentiment Friday night, and it made me smile. Parity is happening, and there is now hope for every team that they too can make it to the Final Four someday and even win a National Championship. UConn’s loss has shown everyone that no person or team is utterly infallible, and that each and every one of us has a bad day sometimes. 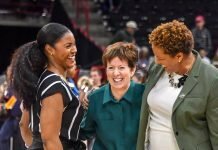 The women’s basketball community owes the Huskies gratitude, because it’s in our sport that the longest winning streak in sports history now lies. UConn has been a model for other players and programs to follow, and they’ve set a bar that’s inspired countless athletes. 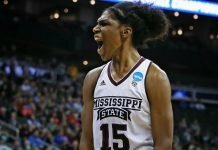 The community also owes thanks to Mississippi State – a team of non-All-Americans who worked hard this year and knocked off a giant because they believed. They are helping to create more places at the women’s basketball table that UConn’s dominance has blocked. This was arguably the best NCAA Tournament in its 36-year history, full of heart-stopping close games and upsets. Ending with the upset of the most dominant team at the college level paves the way for more parity, which grows the game. UConn may be back for revenge next year, but so will a lot of other teams. Everybody is getting better. And it’s great for the game.